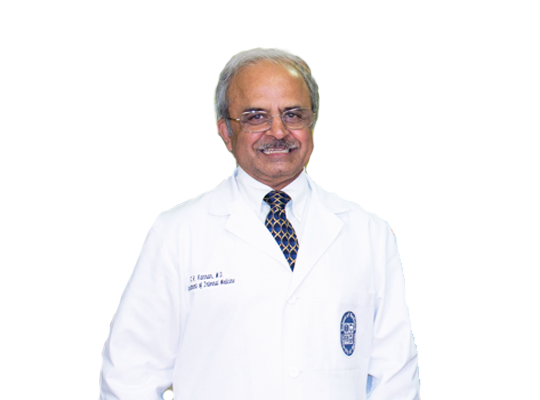 Dr. Kannan is presently Director of Endocrinology and Metabolism at Red Rock Medical Center in Las Vegas. He served as Professor of Internal Medicine at the University of Nevada School of Medicine in Las Vegas from 2009 to 2013 with teaching and patient responsibilities and was also Consultant in Endocrinology at Southwest Medical Associates in Las Vegas, from 2003 to 2010. He moved to Nevada in 2003 following many years of academic and clinical practice in Chicago. He is the former Chairman of Endocrinology at Cook County Hospital in Chicago, and Associate Chairman of Endocrinology at Rush Presbyterian St. Lukeâ€™s Medical Center. He was responsible for the combined Endocrinology Fellowship Program of Rush Presbyterian and Cook County Hospitals. He is a tenured Professor of Medicine at Rush University, Chicago. During his tenure at Cook County and Rush Presbyterian, he won the Teacher of the Year Award ten (10) times. He has single-authored four (4) medical textbooks and has served as an editor of the Year Book of Endocrinology for 15 years. He has also co-authored several original articles in peer-reviewed journals. To learn more about Dr. Kannan, visit www.redrockmedical.com, or call (702) 877-9514 to schedule an appointment today. Are you a patient of Dr. Chakravarthy R Kannan? Login to your Who Is Who account and share your experience with Dr. Chakravarthy R Kannan. It takes seconds to register. Start your FREE account today and share your expereince with Dr. Chakravarthy R Kannan.